There’s a lot of discussion about training industry trends and creating the kind of content that learner’s want today. But the other – and equally important – side to that equation is the flexibility and responsiveness of the delivery platform to get that training into the hands of those learners. Let’s look at just two features of current eLearning and training trends that are gaining traction in the corporate world and how dependent they are on optimal delivery. Microlearning is a training tactic that uses small, short, specific chunks of content. Microlearning is designed to be easier for learners to grasp without overwhelming them with too much information. Very task specific. Videos, games, quizzes, short e-Learning hits. Microlearning is implemented in corporate training, student education, and more. An instructional technology, microlearning creates microactivities through micro steps in digital media areas. This is already a common reality for today’s trainers. These smaller (or microactivities) can be built into learner’s daily routines and tasks. Microlearning is different from “traditional” eLearning approaches because it emphasizes push technology through push media. These tactics reduce the cognitive load on learners. That means, microlearning is designed to not overwhelm learners. Selecting the right microlearning activities can be important for didactical designs. In other words: microlearning (whether it’s video, eLearning, a game, etc.) needs to be task-specific, short, relevant and TIMELY! It’s about providing exactly what learners need to know – at that moment – wherever they are – accessible on any device. Otherwise, the learning experience loses its optimal value. Video’s obviously been around forever and has always been a leading training trend. Everyone loves to watch videos – assuming they’re done well. So videos that confirm to microlearning concepts are powerful learning tools. But the question arises: where to host them? The ubiquitous, free on-line options are great – unless you need tracking. Without it, you won’t know who’s watching, whether they’ve completed them, etc. so you won’t know whether they are effective. In addition, you probably don’t want your learners being distracted by all the side-bar ads that come with the free platforms. The conclusion is that to really take advantage of the latest eLearning trends, it’s not enough to create great “microlearning” content. You also need an easy way to get that content (whatever it is) to learners easily, frequently, rapidly and on-demand –without IT skills. And you need immediate reporting with up to the minute results so you can know which content is effective and which is not. CloserConnect is a deployment and tracking platform designed from the ground up to take advantage of these trends. It’s agile, responsive, mobile-enabled and incredibly intuitive so admins can deploy training on a moment’s notice to individuals or groups. 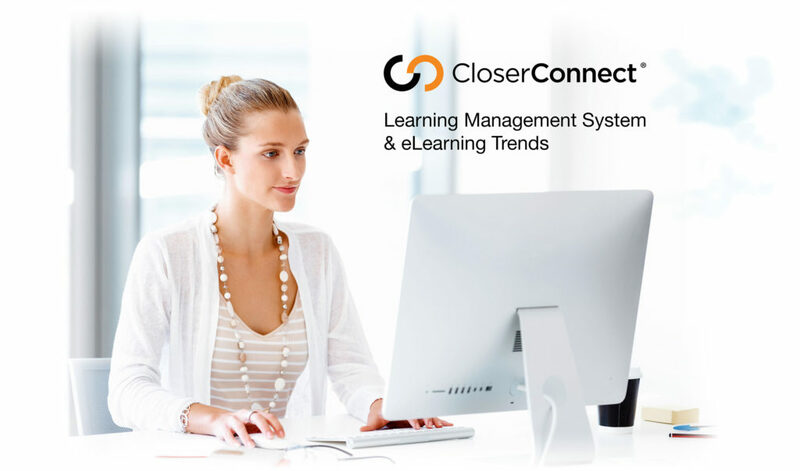 With our platform, we can help you stay ahead of all the latest LMS trends. Tracking is real time with instant reporting reflecting up-to-the-minute results of each learner’s interactions, progress and results. See more on our agile learning management system (LMS). So before you knock yourself out creating great microlearning content, be sure you have a plan to get it to folks quickly and easily – getting the full benefit of all your development efforts. Check out our industry insights blog for more elearning trends and training tips.